NJMC Naturalist Mike Newhouse has compiled the bird-banding statistics for September. He and his band of banders banded 52 species and 551 birds total. 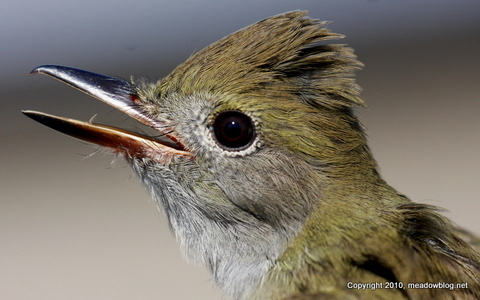 New species for the three-year project were Scarlet Tanager, Great Crested Flycatcher (above) and Acadian Flycatcher. Full list follows. Asterisk denotes threatened, enadangered or special-concern species in New Jersey (5 total). The William D. McDowell Observatory in DeKorte Park begins a new schedule of programming on Wednesday night with free public access at 8 and 10 p.m. — weather permitting, of course. Each evening two major objects in the night sky will be viewed, plus one or two other celestial objects or events depending on the observing conditions.